No one is prepared for the changes ahead when a parent is diagnosed with dementia. And just when you think you have a handle on it, new behaviors can arise, and their symptoms may progress. Memory loss can affect every individual differently and no two days are predictable. This is why Aegis Living developed Life’s Neighborhood™ to provide a better quality of life for a resident with memory loss and peace of mind for families. Our program can meet your parent where they are at in the progress of their memory loss and celebrate every moment. Sometimes it’s the littlest things that matter the most in the joy of a resident—an extra pillow, a hand massage, a favorite song, or sharing a memory. We do our best every day to make sure your parent has the best day. Dedicated 24/7 staff. 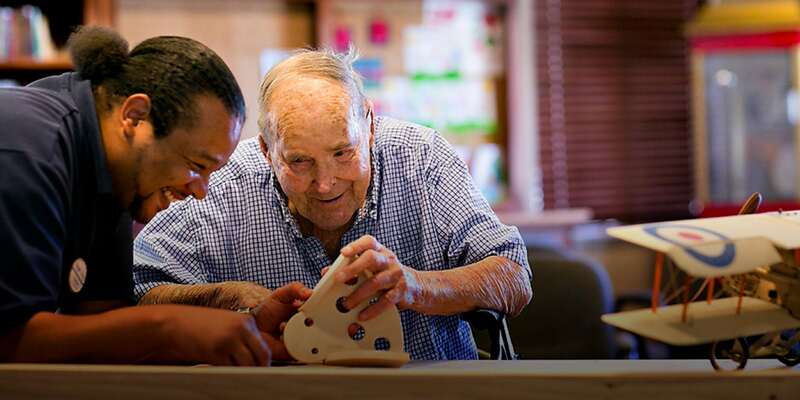 The strength of our program is our specially-trained staff who are equipped with the tools and knowledge to assist our residents with their unique needs and make them feel valued. Our compassionate team uses their patience and understanding to serve our residents with dignity. Uplifting activities. Our specific programming is designed to decrease stress, reduce anxieties, and to be flexible with changes in mood or cognition. We want to celebrate our residents, make them smile, and bring them joy in the moment. Secured living area within our communities. A common symptom in memory loss is the urge to wander. Residents are confused that they need to catch a bus to work, meet a parent, or simply walk out your front door. Our camouflaged doorway is secured for our residents’ safety. We also closely monitor all residents and staff is available 24/7. Personalized care. Our licensed nurse creates a personalized care plan for all of our residents and actively involved in monitor health care needs and changes. Our medication care managers provide assistance with medications. Nutrition and dining. We understand the great pleasure that food can bring, so we make an extra effort to provide not only nutritious food but meals that are tasty and appealing to our residents. Our chefs create a variety of menu items for those who have issues with swallowing or chewing, and visually appealing plates packed with color for those residents with a weaker sense of smell and taste. And our intimate memory care dining rooms offer greater personal assistance during meals. Life skills stations. We have created nostalgic vignettes to spark memories for our residents of when they were a young parent, working in a career, or taking a favorite vacation. Our residents find great comfort in these familiar settings, often encouraging stories and engagement with caregivers. Additional services. To meet the needs of your parent, we provide housekeeping, laundry services, transportation, maintenance, and all utilities (except phone and cable services). We also offer a beauty salon and barber within the community. The mother of our CEO and founder, Dwayne Clark, suffered from Alzheimer’s, a challenge that only served to strengthen Dwayne’s commitment to tireless innovation in the field of elder care.